Mobile News: Could a $14M Grant Make Broad St. Safer? The city of Mobile was awarded a multi-million dollar grant that aims to help improve major roadways in the downtown area. The grant, awarded to the city last week, is billed as a way to help generate economic development in the area, but more importantly, will provide residents with transportation options that are not only reliable but also safe. The U.S. Department of Transportation’s Transportation Investment Generating Economic Recovery, or TIGER, grant, will provide $14.4 million in improvements in support of the “One Mobile” plan. One Mobile, once part of the decade-long initiative known as “Bring Back Broad Street,” will encompass Broad and Beauregard in the Hank Aaron Loop. While a timeline has not been confirmed, the city of Mobile will provide an additional $3.32 million in matching funds to get the project rolling, according to news reports. One Mobile would allow for the city to have the financial power to change what AL.com calls “an area that’s deficient in economic development” by extending the length of Broad and Beauregard Streets, replacing roads, sidewalks, and stormwater drainage systems, and adding bike lanes, street lighting, medians, landscaping, and delineated bus stops. The 3.7 mile stretch of Broad Street currently would be categorized as an “incomplete street” by SGA — meaning, a street designed with only cars in mind that limit transportation choices and make walking, bicycling, and taking public transportation inconvenient and possibly dangerous. One Mobile intends to tackle an area that’s littered with repair patches and crumbling sidewalks, and such improvements could prove extremely beneficial for drivers, pedestrians, and bicyclists alike. For example, when cities across the United States used complete street planning, SGA found that 70 percent of the cities saw a reduction in collisions, while 56 percent saw fewer injuries overall. Pedestrian and bicycling activities also rose in these cities, while automobile traffic fell by nearly half in some areas. 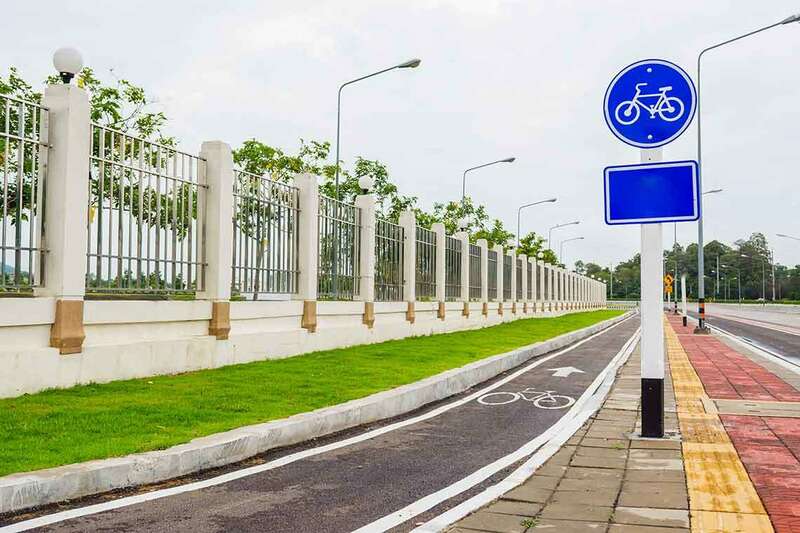 Such pedestrian sidewalks and bicycle lanes could help to provide more choices for travel and disperse vehicle traffic at the same time, according to U.S. Federal Highway Administration. Such features would also cut down the high levels a risk a pedestrian or cyclist faces who must walk along or cross busy arterial street. A study conducted by TRIP, a leading nonprofit national transportation research organization, found that roadway features are likely a contributing factor for approximately one-third of fatal traffic crashes in the state of Alabama. TRIP suggests incorporating medians to help alleviate such accidents on roadways, like Broad Street. The FHWA also points to the benefits of the inclusion of medians on busy roads. A finding pointed to a 46 percent decrease in non-intersection pedestrian crashes when medians were added at pedestrian crossings. When medians were installed at unmarked crosswalk locations, the FHWA found a 39 percent decrease in such accidents. The One Mobile plan also aims to install more street lights down Broad, which would be another beneficial safety measure on the sometimes deadly thoroughfare. Street lighting helps to improve visibility without a driver solely relying on headlights alone, and can reduce the risk of a crash by approximately 30 percent, according to the Lighting Research Center. The lights would also allow drivers to easily spot pedestrians and road markings while driving at nighttime. One of TIGER’s main goals is to promote a city’s economic advancement through capital projects. Now that Mobile has been granted the funds, Mayor Sandy Stimpson believes the impact will be extensive. He sees the plan affecting five distinct communities in the Mobile area and attracting commercial development along the newly improved Broad Street. The improvements that would be brought by the TIGER grant will allow officials to link them to other federal spending projects in the areas, as noted by AL.com. This includes a housing and urban development funding and a U.S. Interior Department grant to create a walking trail along Three Mile Creek. “This project will connect citizens from the transportation hub on Water Street to homes in neighborhoods to jobs at Brookley Aeroplex to recreation on the Three Mile Creek Greenway,” he told AL.com. Broad Street’s revitalizing transformation will be a welcomed change for Mobile residents, but it will not happen overnight. Car and pedestrian accidents are still likely to occur on this major roadway. Visit our contact us page to learn more about steps you can take if you or a loved one has suffered injuries because of an accident in the Mobile area.